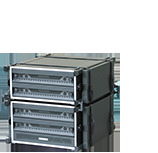 Light and rugged transport, storage and management of deployed systems. 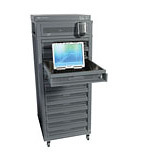 The Tracewell E-Tool product line provides light and rugged transport, storage and management solutions for a variety of mobile electronic equipment and deployed systems. 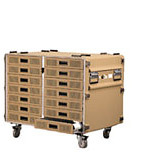 This highly modular cabinet system, which includes deployed, rugged-deployed and secured CAC deployable cabinets, is designed for a variety of defense and commercial environments ranging from hangers to more harsh or extreme conditions where mobility is key. Tracewell engineers created E-Tool with a unique cabinet design of highly durable aluminum. This provides a rigid core construct resulting in weight savings of over 200 pounds, as compared to other steel transit cases. 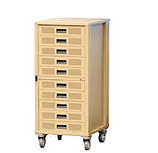 In addition, E-Tool cabinets can easily integrate a variety of power supplies, and be customized to meet specific thermal and network connectivity specifications. Highly modular cabinets for a variety of mission environments. For secure transport, storage and onsite management of laptops and mobile electronics, designed for worldwide use in maintenance hangers and flight lines. Designed for the secure storage and transport of deployed networks, weapon systems, medical devices and other classified critical systems in harsh environments. Designed for the secure storage and transport of deployed networks, weapon systems, medical devices and other classified critical systems in use in maintenance hangers and flight lines. Designed to provide portable, lightweight & secure storage and transport of portable maintenance aids (PMAs) on the flightline. Intelligent power and thermal management.